I don't know about you and your children, but Curious George is a pretty big hit in our home. Our children have grown up reading the books and watching the movies. One of my boys used to watch Curious George every single day... he never got tired of it! Do you have a huge fan of Curious George in your home, too? How about a dancing kid? Well, Curious George is celebrating the arts with his first ever Dance Contest! 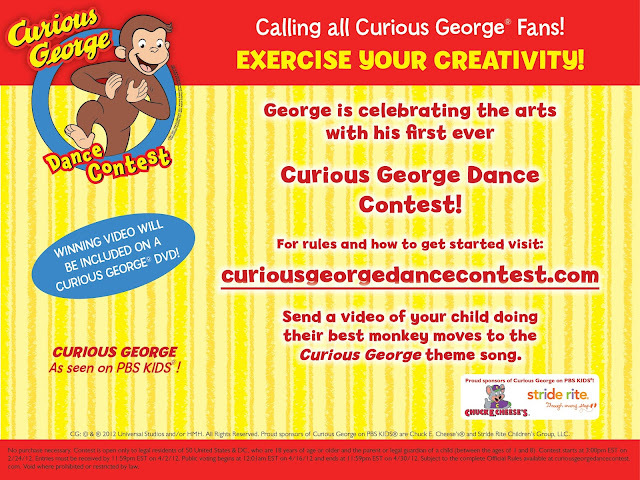 Video your child dancing to the Curious George theme song and submit it for a chance to win some great prizes! They might even win a visit from George himself! A panel of judges will review the video submissions and pick 10 finalists. Enthusiasm, creativity and originality are key! Contest ends April 2nd. so be sure to hurry and get those adorable moves captured! So, what are you waiting for? Grab your camera, cellphone, video recorder or webcam and get that kiddo dancing! Dancing is a fantastic way to get your child up and active and having fun with Curious George. Who can beat a great time like that? I can't wait to see all the adorable videos that everyone sends in... dancing kids are the best! Do you have any special Curious George stories or a child that loves to dance? I'd love to hear about it so leave me a comment below! Disclosure: This post is sponsored in collaboration with Latina Bloggers Connect and WGBH.